Two big Scandinavian names of the European club handball history have been pitted against each other again as the three-time Chamnpions League winners from Viborg HK will meet the 2011 trophy holders Larvik in the Women's EHF Cup 2017/18 Quarter-final. 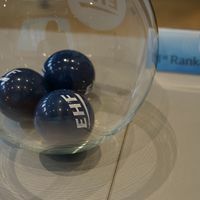 The draw at the EHF Office in Vienna has determined all four quarter-final pairings and also the semi-final fixtures. The winner of the big Nordic clash will meet the more successful team of the pairing between Vipers Kristiansand from Norway and Brest Bretagne Handball from France. Markus Glaser, EHF Chief SPorts Officer together with Bjørn Bjune from Larvik have conducted the draw in the EHF Office. "We are very satisfied with the draw. It gives us two clashes with a very attractive opponent from the spectators' and also sporting point of view. We are also glad we avoided Kristiansand, who, I hope, we meet in the semi-final. I would like to see Larvik as favourites in the quarter-final against Viborg although we have to pay respect to their strentgh," Bjune said after the draw. The first quaretr-final leg is scheduled for 3/4 March and the second leg will follow one week later.